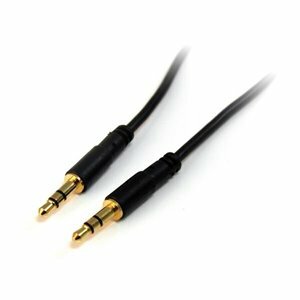 Easily connect an iPod or other MP3 player to a car stereo.This 3-foot Slim 3.5mm Stereo Audio Cable is the perfect solution for portable audio devices (iPod, iPhone, MP3 Players), featuring a slim connector molding that fits easily into a 3.5mm headphone jack, even if the iPod/iPhone/MP3 player is in a protective case. This 3-foot Slim 3.5mm Stereo Audio Cable is the perfect solution for portable audio devices (iPod®, iPhone®, MP3 Players), featuring a slim connector molding that fits easily into a 3.5mm headphone jack, even if the iPod/iPhone/MP3 player is in a protective case. Gold-plated, molded connectors with strain relief ensure a solid high quality connection between connected devices.